Coffee cake has been on my list of Paleo goodies to create, and I finally did it! 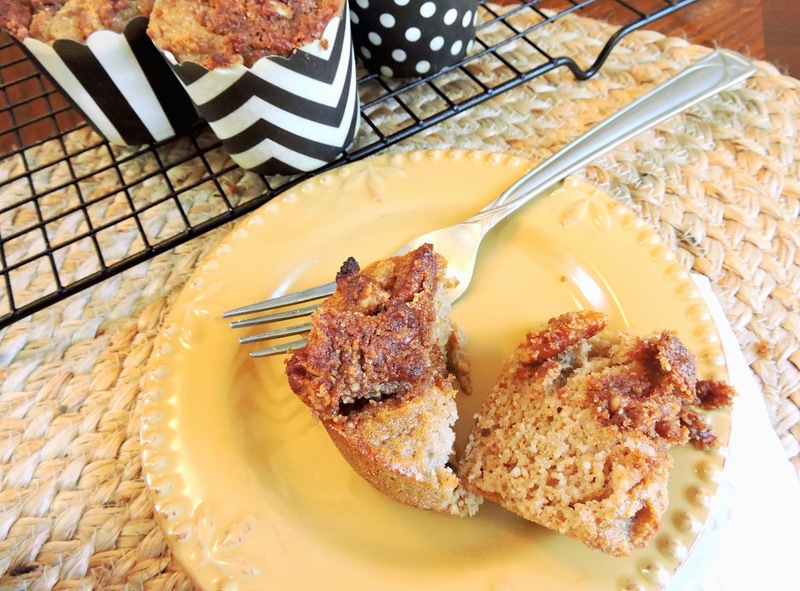 I love the sweet, warm, buttery flavors in coffee cake- and felt like this would be the perfect treat (or breakfast) for the fall season. Of course the thought of making an actual loaf or cake is always frightening to me for some reason, as I have mentioned before. So, I decided to opt for the less messy, easier to bake version: ...muffins! I always feel like muffins are so much more convenient, and minimize the stress factor since you don't have to worry about slicing them into pretty pieces. 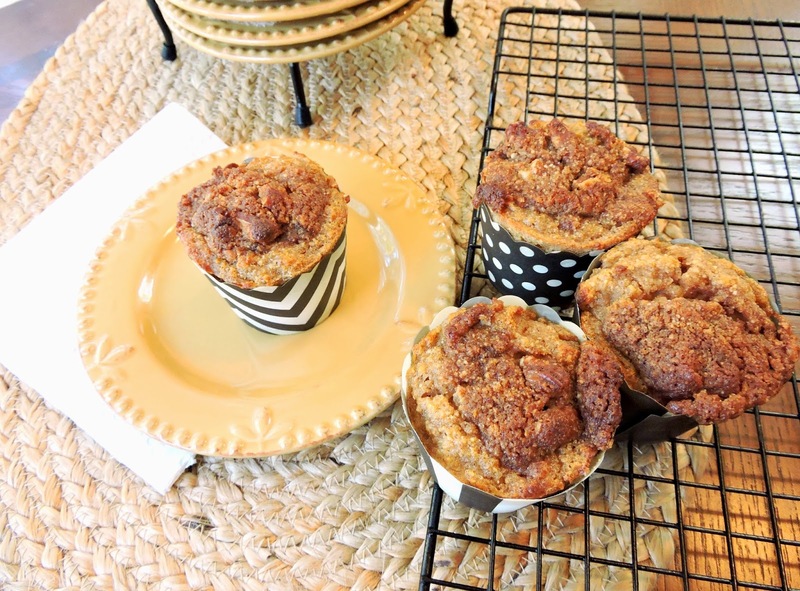 What makes these muffins even easier are the sweet little cups I baked them in! I purchased my free-standing baking cups at HomeGoods, and absolutely LOVE them. They come in cute patterns and make the baking process so much easier. Just spread them out on a cookie sheet & fill as you would a standard muffin tin. 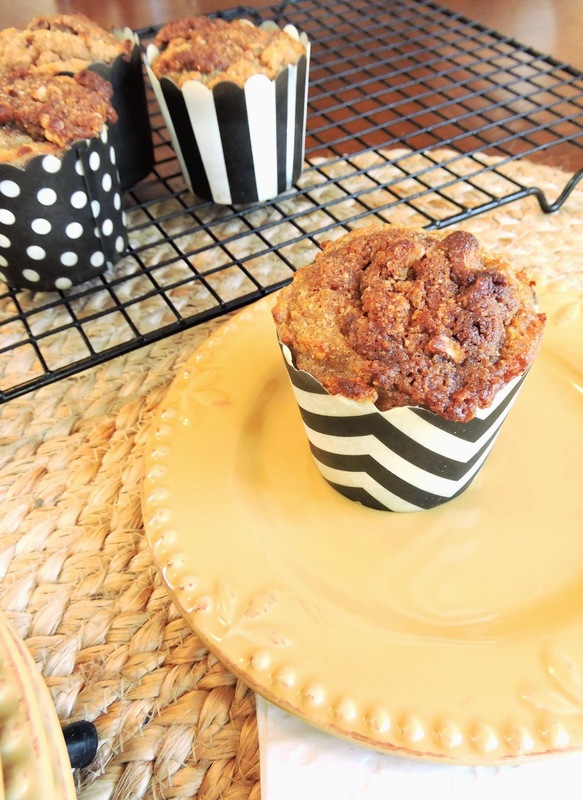 This muffin recipe slides right out of the paper with absolutely no sticking! They are perfect for taking on the go or giving as a little "baked good gift", since they are ready to eat straight out of the oven. Another thing I love about this recipe is that it is completely nut free. I often get requests for how to substitute coconut flour in my recipes, so I decided to go directly down that path this time and skip the almond meal. Plus, I was out of almond meal and had a giant bag of coconut flour that I found at Costco. Coconut flour is also much cheaper than almond meal- so give it a try! 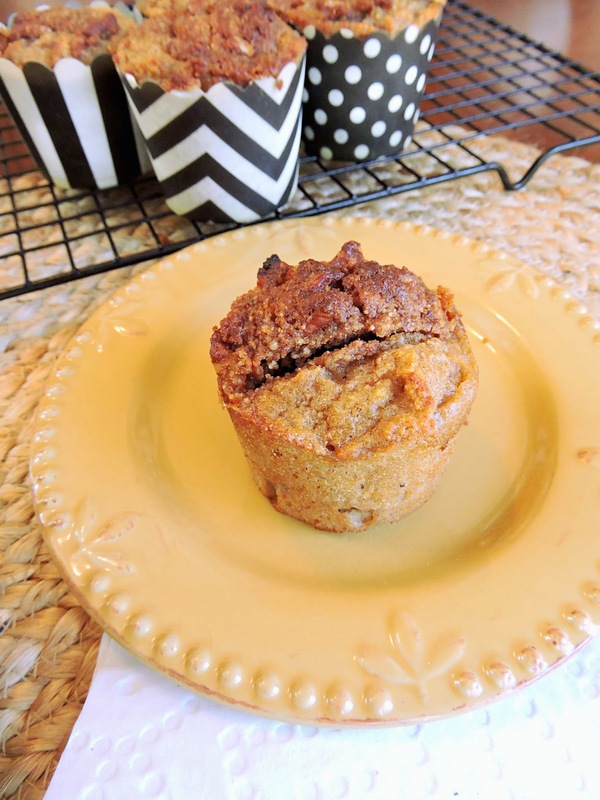 I added applesauce to give a slight apple flavor while keeping the muffins super moist. It goes perfectly with the cinnamon & is extra amazing with the pecans on top. Of course you can leave those out if you are going nut-free! Please let me know if you try these out, and share your feedback in the comments. I hope you love them! In a medium bowl, mix the dry muffin ingredients until combined. Mix the wet ingredients together in a separate large bowl (eggs, vanilla, honey, coconut oil, and applesauce). Slowly add the dry ingredients to the wet, mixing in about 1/3 of the dry mixture at a time- until it is all well combined with no dry clumps remaining. In a small bowl, combine the topping ingredients with a spoon or your fingers. Place a small amount of the topping over each muffin cup- and don't worry if it's not completely covering the top; the topping will melt further & spread while it's in the oven. Bake for 22 to 25 minutes, or until the topping is melted and the edges of each muffin are golden brown. These look so yummy! I am so looking forward to trying them. Quick question: I'm probably missing it in your post, but how many do they make? Thank you for want you do! Hi Abbie! I should have mentioned that if I didn't- but the recipe makes about a dozen :) Let me know if you try them out! I hope you like them! These turned out perfect! Thank you for a yummy muffin recipe. I found the muffin itself to not be too sweet which I really prefer. These will go in my recipe file to make again. Thank you! Happy Holidays! Hi Laurie! Thank you for the great feedback- that made my day! I'm the same way with my muffins; especially when they have a sweet topping. Happy Holidays!